As a leading Web Designing & Development company offers PHP Development Services to meet the specification of your Business Performance. Web development service is one of the most important aspects of today's life. 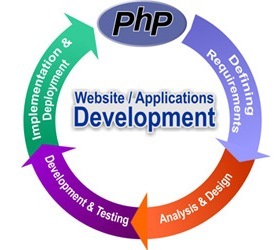 The centralized data in PHP Web Development service allows users to access data from different sources like documents, software, games and images. Web development service, an Application Programming Interface (API) or software system is mainly designed for interoperable interaction over a network. As the provider entity provides web service functionality with a provider agent, even a requester entity uses the web service functionality with a requester agent. The development of SOAP servers and clients is performed by using PHP class library and the XML-RPC servers and clients are developed by using XML-RPC extension respectively. We are the best web development service company for clients who desirably deserve to use the technologies like LAMP, JAVA/J2EE, and ASP.NET. Our development team is an expert in Open Source Technology platform which provides the client to execute wide-ranging applications. Our experienced web developers provide browser-based solutions ranging from simple application to comprehensive portals. Easy information sharing within the workgroups or with extended users outside the company such as vendors, customers and associates are enabled by implementing the designed niche communications tools like Intranet and extranet.